Google Mobile Ads SDK for iOS. GDApi_Framework is located on Github and availabe to download. After downloading the GDApi_Framework folder, to include it on your project workspace, you need to follow the steps below. Select "Add Files to Your Project". 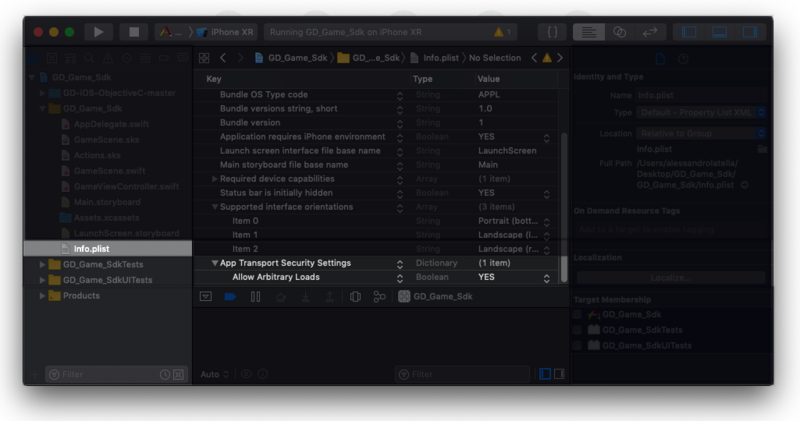 Alternatively: you can also drag and drop GDApi_Framework into your project workspace on Xcode. Do not forget to add the 'Google Mobile Ads SDK' as well, otherwise it is won't be possible to receive Ads. Right-click under the list and select "Add Row"
When all is done, you are ready to use our api! this initialization also shows an interstitial ad if preroll is enabled on your profile. This function takes several params. * Add methods below as how they are into your ViewController (where you want to listen events). Method names must be the same. * **onBannerReceived**: This event is fired when an ad is received. Also "adType" of data contains the type of ads loaded. * **onBannerStarted**: This event is fired when an ad starts to show up. * **onBannerClosed**: This event is fired when an ad is closed. * **onBannerFailed**: This event is fired when an ad is failed to load. Also, "message" of data contains why. * **onAPIReady**: This event means the api is ready to serve ads. You can invoke "showBanner". * **onAPINotReady**: When something goes wrong with the api, this event is invoked. Api is supposed to be init again. * **onPreloadFailed**: This event is fired when preloaded ad is failed to show. Also, "message" of data contains why. * **onPreloadedAdCompleted**: This event is fired when preloaded ad is closed. * **onAdPreloaded**: This event is fired when an ad is preloaded.